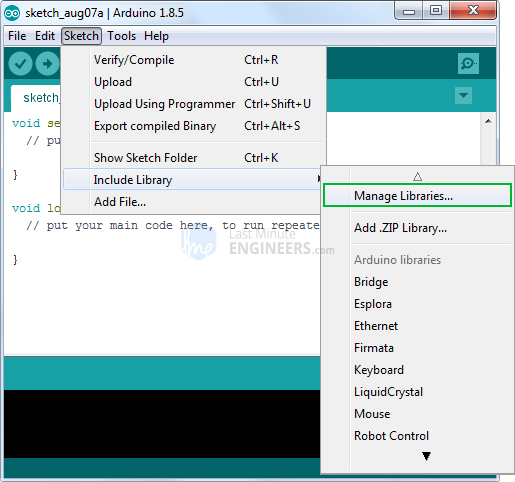 Give your next Arduino project the ability to sense the world around it with BME280. These sensors are fairly simple to use, pre-calibrated and don’t require extra components so you can start measuring relative humidity, temperature, barometric pressure & approx. altitude in no time. At the heart of the module is the next-generation digital temperature, humidity and pressure sensor manufactured by Bosch – BME280. It’s a successor to sensors like BMP180, BMP085 or BMP183. This precision sensor can measure relative humidity from 0 to 100% with ±3% accuracy, barometric pressure from 300Pa to 1100 hPa with ±1 hPa absolute accuracy, and temperature from -40°C to 85°C with ±1.0°C accuracy. The pressure measurements are so precise (low altitude noise of 0.25m), you can even use it as an altimeter with ±1 meter accuracy. The module comes with an on-board LM6206 3.3V regulator and I2C Voltage Level Translator, so you can use it with a 3.3V or 5V logic microcontroller like Arduino without worry. 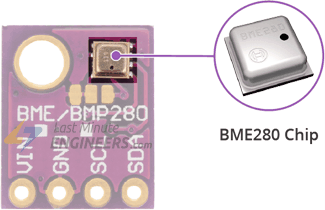 The BME280 consumes less than 1mA during measurements and only 5μA during idle. This low power consumption allow the implementation in battery driven devices such as handsets, GPS modules or watches. The module features a simple two-wire I2C interface which can be easily interfaced with any microcontroller of your choice. 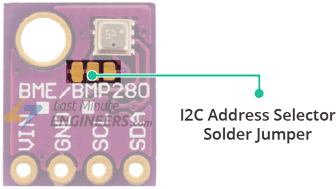 The default I2C address of the BME280 module is 0x76HEX and can be changed to 0x77HEX easily with the solder jumper besides chip. Locate the solder jumper besides chip. By default the middle copper pad is connected to the left pad. Scratch the connection between the middle and the left copper pad to disconnect those using a sharp knife. Add a solder blob between the middle and the right copper pad to join them. It allows you to set the I2C address 0x77HEX. VIN is the power supply for the module which can be anywhere between 3.3V to 5V. Let’s hook the BME280 module up to the Arduino. Connections are fairly simple. 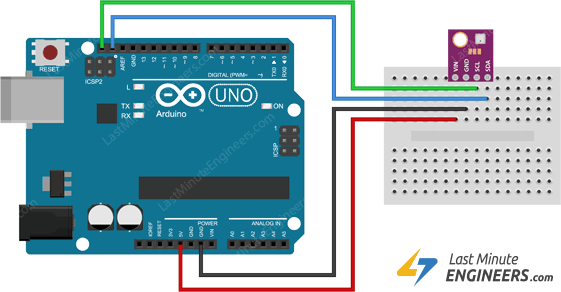 Start by connecting VIN pin to the 5V output on the Arduino and connect GND to ground. 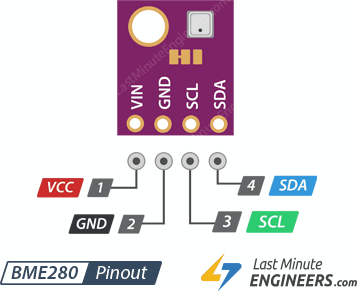 The following sketch will give you complete understanding on how to read temperature, relative humidity & barometric pressure from BME280 module and can serve as the basis for more practical experiments and projects. The sketch starts with including four libraries viz. Wire.h, SPI.h, Adafruit_Sensor.h and Adafruit_BME280.h. 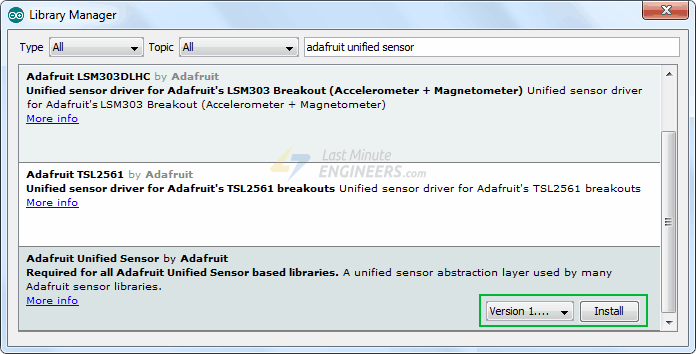 Next, we define SEALEVELPRESSURE_HPA variable needed to calculate the altitude and create an object of Adafruit_BME280 library so that we can access functions related to it. In setup section of code we initialize the serial communication with PC and call the begin() function. The begin(I2C_ADDR) function takes the I2C address of the module as parameter. If your module has different I2C address or you changed it, you need to specify it correctly. This function initializes I2C interface with given I2C Address and checks if the chip ID is correct. It then resets the chip using soft-reset & waits for the sensor for calibration after wake-up. 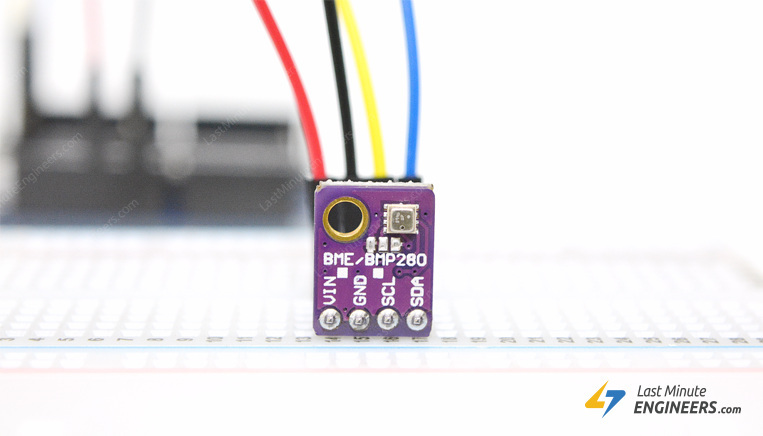 In looping section of the code, we use following functions to read temperature, relative humidity & barometric pressure from the BME280 module. readTemperature() function returns the temperature from the sensor. readPressure() function returns the barometric pressure from the sensor. 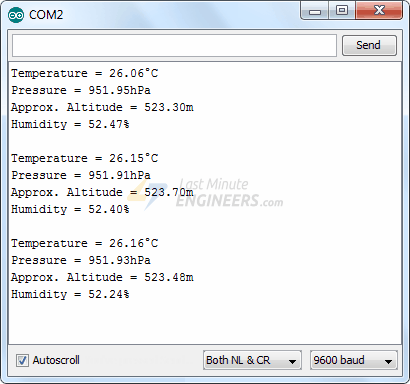 readAltitude(SEALEVELPRESSURE_HPA) function calculates the altitude (in meters) from the specified atmospheric pressure (in hPa), and sea-level pressure (in hPa). readHumidity() function returns the relative humidity from the sensor.